"What Is Pho And What Are Its Health Benefits?" [fuh]: Pho was born in Northern Vietnam during the mid-1880's. The dish was heavily influenced by both Chinese and French cooking. 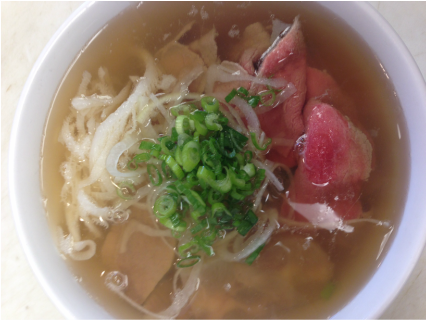 In fact, it is believed that "Pho" is derived from "pot au feu" a French soup. Vietnamese cooks blended the Chinese, French and native influences to make a dish that is uniquely Vietnamese. 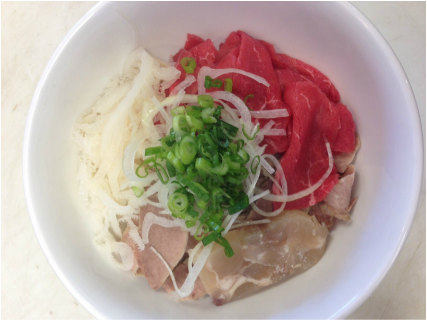 Pho is commonly served with aromatic beef broth poured over rice noodles with your choice of different toppings and it comes topped with thinly sliced onions and scallions. When you go to a Vietnamese restaurant, it’s important to know what Pho is and what it isn’t and to be able to identify it quickly to place an order or to at least know you’re browsing that section of the menu.
. Pho can be ordered without meats or with meats on the side (e.g., rare beef, chicken or beef ballls) in which case you’ll need to validate by some other ways.
. Pho chay (vegetarian pho) which is normally served at Buddhist temples, vegetarian restaurants, or at many regular Pho places. Pho chay looks and tastes somewhat different from the real pho, but it is considered Pho regardless.
. If you’re at a restaurant and the menu specifically says such Pho dish is a specially created dish, or otherwise acknowledging in some way that it’s not a regular Pho, because they have meats other than beef or chicken in it, then conditions 1 and 2 above can be relaxed. The idea here is a chef has every right to be creative with his/her food, and if the chef makes a clear distinction of what is authentic Pho and what falls under the creative license arena, then it is totally acceptable. And that is exactly what the chefs at Pho Vy do. They use their own family recipes combined with super fresh produce and vegetables and the best cut aromatic meats and broth for your pleasure.